Grange de Rey is a beautiful, newly-renovated barn, dating back 200 years and set in breathtaking countryside in the heart of rural France. It has been sympathetically restored so that much of the old charm has been retained and it is situated in open countryside with a working farm nearby. A 15 minute drive brings you to the medieval market town of Figeac. The barn is situated on a hillside and has stunning views to the south west. Local activities include canoeing, golf, walking, cycling, horse riding, sightseeing, water park, caves, chateau’s, farmers markets and great selection of food! The barn has everything you would expect from a comfortable family home and is beautifully appointed, it has many amenities including flat-screen TV, satellite receiver, DVD player, DVD library for kids, games, books, a pool and a barbeque. The primary feature on the first floor is the large communal living, dining and kitchen area with cathedral ceilings revealing the original oak beams and stone work. The communal living area has a large picture window which opens via French doors onto a raised terrace with its “abri du jardin” – a 9m by 5m in area - providing relaxing outdoor living during your holiday stay. The abri is a popular addition to many properties in the area and is effectively a conservatory where the glass windows are replaced with patio screen, excluding flying insects and allowing for alfresco dining with extensive views over the surrounding countryside. In summer, the abri becomes an open-air extension to the living room and the effect is to create substantial space in which to enjoy your holiday. Two double bedrooms each with storage space and twin beds. In each of these bedrooms one of the twin beds has a separate pull-out bed and mattress..
On the ground floor ... Bedroom 1 - has a king size bed with wardrobe and drawer set and adjoining is an en-suite bathroom with a bath/shower, sink and toilet. It also has an external door opening onto the terrace by the pool. Bedroom 2 - has a king size bed with wardrobe and drawer set and adjoining is an en-suite bathroom with a shower, sink and toilet. It also has an external door opening onto the terrace by the pool. Bedroom 3 - has two single beds that can be pushed together, if required, to make a double. Whilst smaller than the other two ground floor bedrooms, bedroom 3 has a built-in wardrobe with a set of drawers. A family bathroom with bath/shower, sink and toilet is located on the ground floor among with a utility room, complete with washing machine. Grange de Rey has a gated entrance, a large garden (4000 sq metres) and ample space for parking cars. At the top of the garden are is space ideal for ball games and there is plenty of space in the garden for children to play safely. The 4.6m diameter pool is visible from the terrace which is in full sunshine throughout the day. Sun loungers are provided. It is an above-ground pool which is surrounded at water level by a raised area of wooden decking with fence and lockable gate providing security when not in use. The pool is 1 meter deep and is cleaned and tested regularly to ensure water quality. Reyrevignes is within the ‘Parc Naturel Regional des Causses du Quercy’, an area designated for its outstanding natural beauty. The village has a bakery producing fresh bread daily. The larger villages of Livernon and Assier (and its famous Chateau dating back to the 16th century) are both just 4.5km away, both have bars/restaurants as well as bakeries, butchers and convenience stores. Nearby Figeac is just 15 minutes drive away with a range of shops and supermarkets. Figeac has a wonderful farmer’s market every Saturday centred in the market square. The town is situated on the River Cele which joins the river Lot at the beautiful and famous village of St Cirq Lapopie. The nearby river Lot is a great attraction for water-based activities and very popular in summer for canoeing, boat trips and fishing. This sparsely populated area also has some fantastic walks without encountering armies of tourists. Reyrevignes has a public tennis court available for hire for a small charge. Local activities include canoeing on the Célé, the Lot and the Tarn rivers, There are many beautiful nearby villages and market towns including the cliff-side towns of Rocamadour, St Cirq Lapopie, Cordes sur Ciel and Najac. The Lot is proud of its fine, local produce from truffles to confit of duck & goose, to dark red Cahor wines and the goat's cheese of Rocamadour. Very close to Grange de Rey are many good restaurants and all are worth a visit. The owners’ recommendations are listed in the house with contact details. Grange de Rey is in a rural location adjacent to a working farm - peaceful and relaxing - with extensive views of the open countryside around. Yet only 15 minutes from Figeac town centre. It has a gated entrance guaranteeing privacy and a large garden great for children. The pool is fenced and locked for security of children. The property is optimized for 2 families with children. There is an additional 2 under-beds suitable for children under 5 in each of bedrooms 4 and 5 and 2 cots for infants bringing the total maximum capacity to 14 individuals. Nous avons passé un superbe séjour dans cette maison magnifique, et tres confortable. Tout est pensé pour le confort (2 frigos, 2 fours, moustiquaires aux fenêtres, torchons, serviette de plage,etc). La ferme est au calme, parfait pour se reposer. David parle bien français, donc pas de soucis pour les francophones. David et Nancy sont vraiment très accueillants, on se sent en vacances en famille avec eux.Merci encore ..
Vous pouvez y aller les yeux fermés, très bon séjour garanti..
"Matthieu avec sa famille et ses amis étaient des invités fantastiques et apprécié tous les aspects de leur séjour à Grange de Rey. Les enfants étaient enchanteurs et c'était un grand plaisir de les accueillir en août 2017. Nous espérons qu'ils seront de retour à Grange de Rey bientôt. Matthieu with his family and friends were fantastic guests and enjoyed every aspect of their stay at Grange de Rey. The children were enchanting and it was a great pleasure to have them all as our guests in August 2017. Their review translates as follows ... Hello We had a wonderful stay in this beautiful house, and very comfortable. Everything is thought for comfort (2 fridges, 2 ovens, mosquito nets to the windows, dish towels, beach towel, etc). The farm is quiet, perfect for resting. David speaks French well, so no worries for francophones. David and Nancy are really very welcoming, you feel like a family holiday with them. Thanks again .. You can go there with your eyes closed, very good stay guaranteed David et Nancy"
Le gîte est spacieux, très propre, très confortable et parfaitement équipé. Sans oublier l' accueil fort sympathique de David et Nancy , toujours soucieux que tout se passe pour le mieux. Nous recommandons sans hésiter cette location pour passer de très agréables vacances en grand groupe. Martine, Peirre, leurs enfants et leurs petits-enfants ont adoré leur temps dans ce cadre rural - se promener chaque jour et profiter du mode de vie à la campagne. Nous avons eu le plaisir de les accueillir à la Grange de Rey et nous espérons qu’ils reviendront bientôt. Ils ont quitté la maison dans un état impeccable et nous les remercions d’être une si belle famille. Martine, Peirre, their children and grandchildren loved their time in this rural setting - taking walks daily and enjoying the country lifestyle. It was our pleasure to have them as our guests at Grange de Rey and we hope they will visit again soon. They left the house in impeccable condition and we thank them for being such a wonderful family. Nous avons passé une semaine très agréable grâce à l’accueil de Dave et Nancy qui sont à la fois prévenants et discrets. Le gîte est très grand, très propre et vraiment confortable. Même les serviettes de piscine sont fournies! Tout le nécessaire est présent en cuisine pour les grands groupes. Chaudement recommandé pour 3 familles avec enfants. Nous avons accueilli trois belles familles et leurs enfants à Grange de Rey pour leurs vacances d'été. Ils ont passé de très bons moments à la Grange de Rey. Les enfants toujours à la piscine et les parents s'amusant ensemble à faire ce que les français font de mieux: manger, boire et s'amuser ensemble. Ils ont pris grand soin de la maison et ils ont été un plaisir d'avoir comme invités! s'il vous plaît venez nous rendre visite à nouveau. For the benefit of our English-speaking guests the review translates as follows … We spent a very pleasant week thanks to the welcome of Dave and Nancy who are both considerate and discreet. The cottage is very big, very clean and really comfortable. Even pool towels are provided! Everything you need is present in the kitchen for large groups. Warmly recommended for 3 families with children. We welcomed three lovely families and their children to Grange de Rey for their summer holidays. They had a wonderful time at Grange de Rey. The children always in the swimming pool and the parents enjoying their time together in the abri doing what the french do best - eating, drinking and enjoying each others company. They took great care of the house and they were a pleasure to have as our guests! Please come and visit us again. It was a great pleasure to have Pierre, Natalie and their three lovely children as our guests in the barn. It was a pleasure getting to know them. They enjoyed every minute of their stay and took great care of the property. We hope they will return and see us again. Nous étions 4 couples avec 3 enfants, maison très agréable à vivre. Les propriétaires, David et Nancy sont des gens charmants, serviables et de bons conseils!!!! La maison est idéalement située, proche de Figeac (10 min), et à 30 min de Rocamadour. De très belles visites à faire. La maison se trouve très proches d'une ferme et donc entourée de moutons et agneaux, les enfants adorent!!!! La maison est spacieuse, avec piscine très bien entretenue. La véranda est dotée de moustiquaires ce qui rend les soirées agréables!!!! Simon and Caroline with their friends, their children and their relatives from Normandie enjoyed their one-week of holiday at Grange de Rey and for the benefit of future English-speaking guests, this was their feedback …. We were 4 couples with 3 children, very nice home to live in.. The owners, David and Nancy are lovely, helpful and gave us good advice! The house is ideally located, close to Figeac (10 min), and 30 min from Rocamadour. Very pleasant places to visit.. The house is very close to a farm and therefore surrounded by sheep and lambs, the kids absolutely loved it !!!! The veranda is equipped with mosquito nets which makes the evenings pleasant indeed. Wonderful people who were thrilled with their choice of holiday home. We especially enjoyed the company of their children whom we escorted to visits to our neighbour's farm and introduced them to their farm animals. 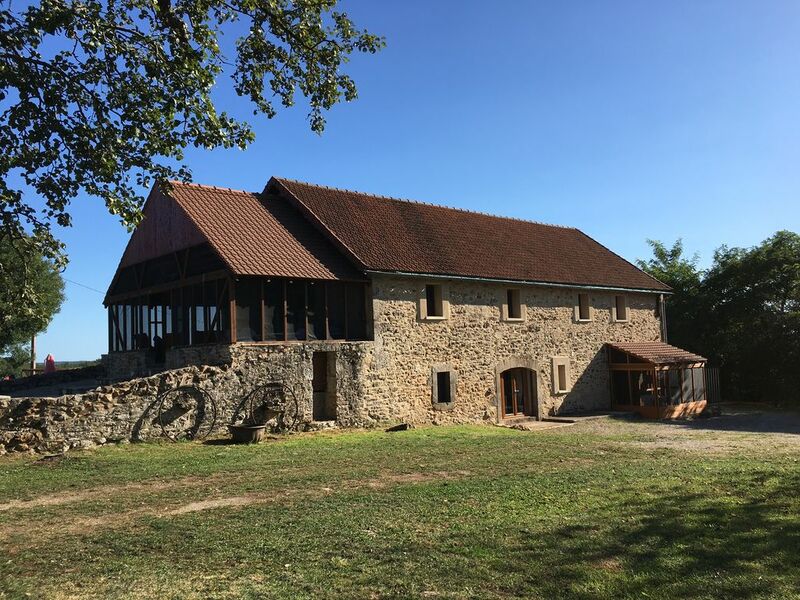 The barn is located within the Parc Regionale Causses du Quercy which is a protected as an area of outstanding beauty by the French authorities. There are over 250 sites of historical interest and many of the villages have been designated as "One of the most beautiful villages in France". The Lot and Cele rivers are nearby and this region benefits from being relatively undeveloped with respect to tourism when compared to holidaying at the coast or in the Dordogne valley which is only 40kms away. Of particular interest is the very low level of atmospheric industrial pollution in this area giving rise to a night sky teeming with stars and a sight our visitors will never forget.